METEOR STRIKE RESPONSIBLE FOR GLOBAL COOLING AND DROUGHT? The 8 Oct. 2009 50 kiloton atmospheric air-burst of a mere ten meter diameter meteor may be partially responsible for the extremely cold winter of 2009/2010 and a related drought in Southwest China. The dust offers nucleation centers and cause precipitation to form quicker. Thus by the time the winds carry the moisture to remote areas, most of it was gone. Latitudes between +/- 46o appear most affected. The eastern states between 38o and 46o north latitude received massive snow falls while areas farther north (Toronto, Vancouver, the Arctic and Siberia) experienced less precipitation or warmer weather. The 8 Oct. 2009 air-burst appears related to a Vulcan induced comet like object based on time co-incidence with the 5 October Camelopardalids comet debris shower. The world is a big place and perhaps there may have been more major meteor air-bursts around 8 Oct. 2009 (+/- 3 days) that were not reported. Some may be anticipating a larger impact in the second half of 2010. If so, California may be required to feed much of the USA. Figure 1. The Blast Is Thought To Be Due To The Atmospheric Entry Of An Asteroid More Than 30 Feet In Diameter The 8 October air-burst of a modest meteor of only an estimated ten meters in diameters producing a mere 50 kiloton air-burst in the high atmosphere may well be responsible for the manifestation of selective drought and widespread global cooling and lower and mid latitudes. The late Sir Fred Hoyle (Royal Astronomer for the UK) claimed that even a 300-meter meteor strike could initiate a world wide Ice Age. The 8 October Indonesian meteor was 27,000 times smaller than the one Hoyle hypothesized, and the world certainly is not in an ice age yet. An asteroid that exploded in the Earth’s atmosphere with the energy of three Hiroshima bombs this month has reignited fears about our planet’s defences against space impacts. The asteroid, estimated to have been around 10 meters (30ft) across, hit the atmosphere at an estimated 45,000mph. The sudden deceleration caused it to heat up rapidly and explode with the force of 50,000 tons of TNT. Luckily, due to the height of the explosion – estimated at between 15 and 20 km (nine to 12 miles) above sea level – no damage was caused on the ground. The asteroid that caused the blast was not known before it hit and took astronomers completely by surprise. The IPCC's computer models have proved just as wrong in predicting global temperatures as the Met Office has been in forecasting those mild winters and heatwave summers, says Christopher Booker. The 'little coverage in Western press' of this asteroid impact may not be so remarkable after all. Comet/Asteroid impacts cause weather changes and now it seems that both events are state secrets. The photographer's reference to this looking like a 'comet-trail' is a clue to why this launch was so spectacular: the skies overhead are laden with comet dust. Space shuttle Discovery left Earth this morning at 6:21 am EDT in a spectacular dawn launch from Cape Canaveral. The combination of sunrise colors and the comet-like appearance of the departing shuttle astonished onlookers. "It was an awesome sight,"
"It was the most incredible launch I have ever seen," says long-time shuttle watcher and part-time NASA medic Dr. Mark Staples of Shands Hospital. "Definitely, it was one of the most spectacular!" agreed Jim Burchfield of nearby St. Cloud, Florida. And Terry Allshouse of Leesburg, Florida, ranked it as "the best of the ten I have witnessed." More superlatives may be found among the links below. This dust is anticipated to have affected our environment is several ways. In some areas, it blocked sunlight needed to evaporate water required for rainfall. In some areas, it blocked sunlight simply cooling the atmosphere. In some areas, it provided nucleating particles for precipitation (snow and rain). Simply put, it caused droughts, widespread cooling and excessive snow fall. These factors are signature characteristic of comet/large meteorite impacts. Should the bolloid impacting over Indonesia been on the order of 300 meters in diameter, there would be a massive surge of rainfall (as in the case of Noah's Great Flood). Then, the globe would descend into an ice age with widespread droughts in many areas. The National Climatic Data Center reports that 1,344 daily lowest minimum temperature records were set in October 2009, and 616 daily highest maximum records were set. 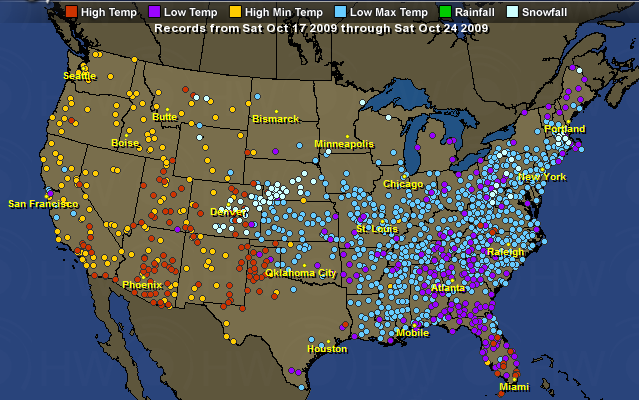 October 2009 was the 3rd Coldest for US in 115 Years. See Table 1. The 8 October air-burst over Indonesia (about 5 degrees south of the equator) seems to have rapidly affected New Zealand in terms of low temperature records. As it was warmer in the Southern Hemisphere this time of year, rain occurred, especially in places near Indonesia. South Australia was greeted with one of the wettest Novembers on record. See Appendix C. The air-burst seems to have introduced precipitation quickly via nucleation particles into the atmosphere and the lower latitudes in both hemispheres benefited as moisture was rapidly removed from the atmosphere. The cooler Northern Hemisphere set record cold and snow records. See Appendices B and C. The winds were quickly dumping their moisture resulting in a severe droughts in drought prone areas like in Yunnan China. This time the drought started in the late October time frame coincident with the air-burst. See Appendix A. Florida's October 2009 started with an all-time hottest record only to have its winter end with 'the coldest winter ever'. Even Hawaii was not immune from low temperature records and the cooling remained into April 2010. Texas experienced record snow falls, some near the Gulf coast and Mexican border. Latitudes in the USA between 38 and 46 degrees experienced extreme - and embarrassing (for Global Warming enthusiasts) snow falls and record cold. The nucleation particles drained these regions of moisture leaving none for the higher latitudes like Vancouver and Toronto Canada. See Appendix D. California experienced some record rainfalls, but the Sacramento delta was not treated to a massive storm surge. Figure 3 shows the USA getting ready for a warm October. Global Warming enthusiasts are set to rejoice with politicians salivating at the prospect of new taxes coming from Cap and Trade issues that would surely be passed at the mid December 2009 meeting in Copenhagen. Then disaster strikes. Figure 4 shows the extent of the disaster in the USA as the eastern half descends into climatic chaos. It is almost as if God (AKA the OVERSOUL) strikes the politicians with a climatic thunderbolt. Washington becomes snowbound. Copenhagen, Denmark has a maritime climate and milder winters than its Scandinavian neighbors. It hasn’t had a white Christmas for 14 years - (Blizzard Dumps Snow on Copenhagen as Leaders Battle Warming). Figure 5 shows that by early December, the southern states were starting to return to normal, but it was still snowing in Copenhagen. 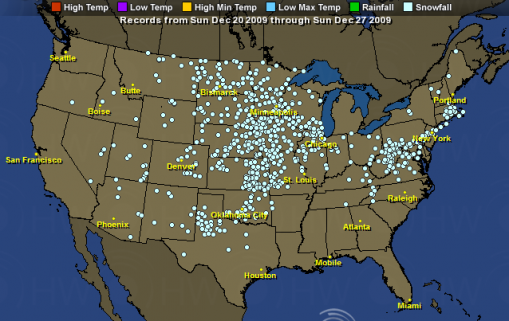 Figure 6 shows snow records still being set throughout the USA. January and February prove equally bad for the politicians. It’s almost as if the planet was trying to send a message to Washington. Figure 6. 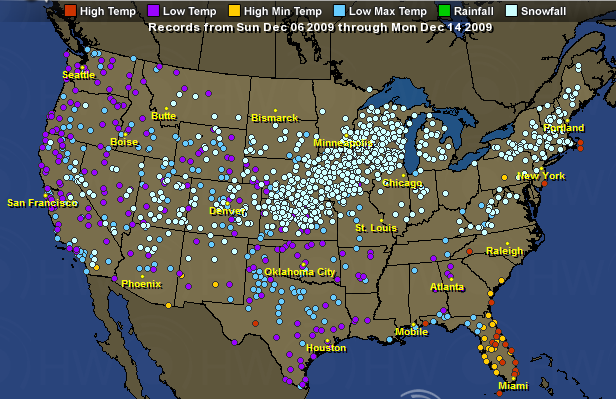 Snow Records in The USA for 20 December to 27 December 2009 By spring, the worst of it appeared to be over although a chill lingered on, even in Hawaii. Figure 8. Dune And Wetter Land Areas (W) During The Last Glacial Maximum. It is interesting to note that California has taken steps to prepare for this contingency as it may be required to feed the entire USA. PETER SCHWARTZ & DOUG RANDALL / GBN Global Business Network October 2003 In 2007, a particularly severe storm causes the ocean to break through levees in the Netherlands making a few key coastal cities such as The Hague unlivable. Failures of the delta island levees in the Sacramento River region in the Central Valley of California creates an inland sea and disrupts the aqueduct system transporting water from northern to southern California because salt water can no longer be kept out of the area during the dry season. $300 million for storm flood management. Gov. 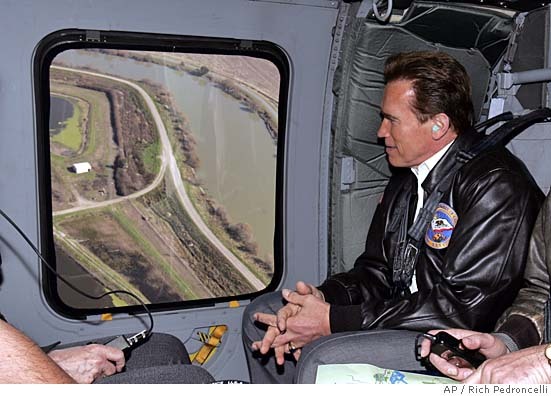 Schwarzenegger highlighted the completion of the repairs on the critical levee erosion sites before the next flood season. "This site and all 29 critical erosion sites we identified in February will be repaired by November 1, just like we planned and the four other critical sites we identified in August are on track to be repaired by November 30," said Gov. Schwarzenegger. "These repairs protect lives and homes which is why we negotiated with the federal government to cut through the red tape and get the necessary permits to start strengthening our levees as soon as possible. Our actions shaved years off the repair times. That's why we can have these finished now before the rains start." The Department of Water Resources pledged to finish the levee repair work on the original 29 critical erosion sites by November and much of the levee repair work was completed ahead of schedule. The repairs on 12 of the 29 critical levee sites identified in the Governor's February emergency declaration are complete, and the remaining 17 sites will be finished by November 1. An additional four sites discovered subsequent to those identified originally identified will also be completed by the end of November. In February, the Governor declared a state of emergency for California's levee system. Since then, state and federal agencies have cooperated in an unprecedented manner to expedite the permits and begin work on these critical repairs. As part of the bipartisan Strategic Growth plan, the November ballot includes a $4.1 billion bond for levee repair and flood control. California may be in a state of financial crisis, but it is 'as ready as reasonably possible' for the consequences of a future impact which could cause a global catastrophe. The 8 October Indonesian meteor air-burst event appears to be related to the current China drought and to the abnormally cold and snowy winter of 2009/2010. There is modest data suggesting that NEWS of this event was at least temporarily suppressed for about 19 days. There may have been more atmospheric air-bursts as this one alone seems insufficient to have caused the observed 'comet dust' in the atmosphere or the global weather changes. 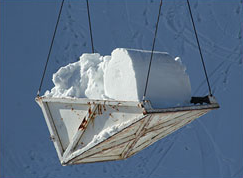 To be sure, 2009 was not the only year snow records were broken. On January 11, 2008, snow falls on Baghdad for first time in memory. This was part of the Jan08 northern hemisphere snow cover: largest anomaly since 1966. But this bears no correlation to a known meteor impact or air-burst event. 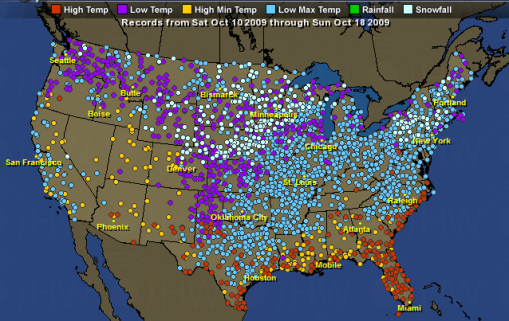 December 2009 was the Second Snowiest On Record In The Northern Hemisphere and October, 2009 was the snowiest October on record in the US, and sixth snowiest in the Northern Hemisphere. The winter of 2009/2010 was the upside-down winter. The 8 October 2009 air-burst event could have partially stimulated the launch of the WISE infrared satellite in December 2009 and whose mission expires in October of 2010. It was designed to detect incoming dark asteroids and comets. An infrared space telescope has spotted several very dark asteroids that have been lurking unseen near Earth's orbit. Their obscurity and tilted orbits have kept them hidden from surveys designed to detect things that might hit our planet. "It's really good at finding the darkest asteroids and comets," said mission team member Amy Mainzer of NASA's Jet Propulsion Laboratory in Pasadena, California, at the Lunar and Planetary Science Conference in Houston, Texas, on Thursday. Richard Binzel of the Massachusetts Institute of Technology says the dark asteroids may be former comets that have long since had all the ice vaporized from their exteriors, leaving them with inactive surfaces that no longer shed dust to produce tails. He points out that many comets have very tilted orbits, and comets visited by spacecraft have been observed to have very dark surfaces. Figure 9. A Staggering Supply Of FEMA Burial Vaults The THE 2010 to 2012 IMPACT THREAT projects that the most dangerous period of this year is around 7 October +/- 6 days. The Web Bot project is suggesting a 'tipping point' around November 2010 (when the existence or ramifications of a possible impact become known to the general public?). Perhaps those FEMA Burial Vaults depicted in Figure 9 may be required. Six very large earthquakes are yet to come during the rest of 2010. A major tipping point will occur between November 8th – 11th, 2010, followed by a 2-3 month release period. This tipping point appears to be US-centric, and could be a dramatic world-changing event like 9-11 that will have rippling after-effects. Earlier this year, Web Bot was also predicting a massive diasporia. ". . . the diaspora/people moving about due to changing circumstances really is 220-million . . . there are at least six great quakes due during calendar 2010 and possibly many more. After six, we stopped looking - not a pretty sight. . . . From the period (approximately) July 7th onward, the data features six clusters of data that will be larger than the global horror that followed the 2004 tsunami. And - sad to report - the data suggests that 220-million will be moving around just on the [american continent] . . .What is clear is that our 'context shift' is 'terra entity', we can't offer any further insight except to say that the data also suggests that by the end of this year, we may see more than a billion people involved in diaspora . . . "
Giant comet/meteorite impacts cause earthquakes and the weather changes that follow could well force a diaspora. One must wonder if a major impact would occur shortly before the November elections (circa October), would there be an attempt to delay the NEWS of its occurrence until after the elections as was done with the 8 October Indonesian air-burst. 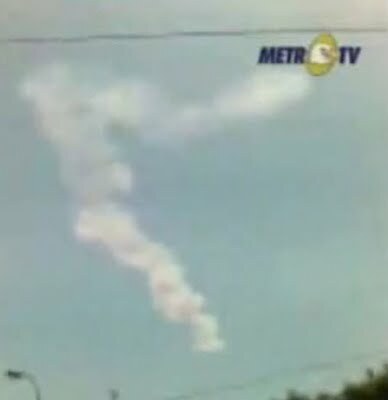 The 8 October 2009 Indonesian air-burst appears to be related to a Vulcan induce comet like object due to the time coincidence in Earth's orbit with the 5 October Camelopardalids comet debris shower. The 5 October debris is know to have an orbit around the Sun that is about 4,000 years long comparable to Vulcan induced comets with average orbital periods 3313 years long. These bodies cross Earth orbit at times predicted by crop circle T367 and this crop circle has been clearly associated with Vulcan because the Sun in crop circle T367 is offset by about 0.35 AU from the centroid and the offset is in the general direction of Vulcan. The association with the 5 to 7 October impacts with Vulcan and the nominal 4000 year comet period means that the threat times can be extrapolated from a similar impact (and weather changing event) that happened 7946 BC. A similar event is anticipated between now and 2015 AD. 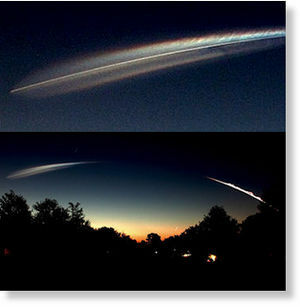 The October 8 2009 air-burst over Indonesia could have been it. But the launch of the WISE satellite suggests that 'others' think the worst is yet to come. Figure 10. Until last summer, more Damoguzhen was home to a lake that stretched across a mile-wide expanse of water in Yunnan, a southern Chinese province famed for its mighty rivers and moist climate. Now a once-in-a-century drought is evaporating drinking supplies and devastating crops The 2009/2010 drought in southwest China is well known, but the important thing to notice is that it began around October 2009, the time of the 8 October 2009 Indonesian air-burst. Note that several of these articles reflect the fact that the Southwest China drought started six months before the publications of these March or April articles. In southwest China, the drought has lasted for six months and is still spreading, resulting in an economic loss of more than $2.5 million in Yunnan province and leaving 19.4 million people facing a shortage of drinking water, according to a presentation made last week by Chen Mingzhong, deputy director general of China's Ministry of Water Resources, to a Mekong River Commission summit. Wells, reservoirs and ponds have dried up in the drought that has plagued southwestern China for nearly six months. 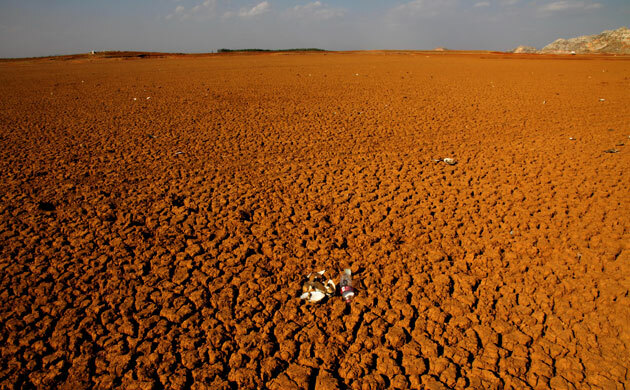 Southwestern China's drought is so severe the government in some areas is rationing just enough water to keep people alive, officials said Wednesday. The drought, the worst in memory, has left more than 20 million people short of drinking water in Yunnan and Guizhou provinces. The region has seen no rain in six months and some communities since January have been rationing just enough water to keep people alive, the official Xinhua news agency reported. Across parts of the region, the government is rationing drinking water to millions, digging 1,600 emergency wells and shooting silver iodide into the air in a marginally successful rainmaking effort. China has been struggling to deal with severe drought in its southwest, which has now gone on for six months. Despite efforts to create artificial rain and divert water resources, the situation remains challenging. Worse yet, it's not just China that is feeling the effects. Southeast Asia is increasingly suffering, with over 10% of Thailand's population in Thai drought- afflicted areas. Figure 11. 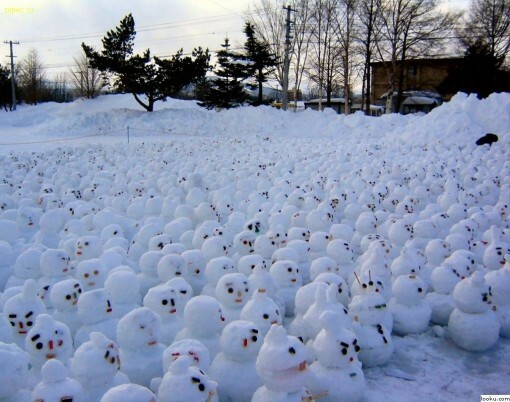 Global Warming Protesters. Comet/meteor impacts, even if they are only air-bursts, inject dust into the atmosphere and that dust blocks sunlight. Apparently, that dust was adequate to make a noticeable affect on the winter of 2009-2010 weather. In December, the Arctic Oscillation went into extreme negative mode — more negative than it's been since at least 1950. Serreze says that has affected weather all over the Northern Hemisphere. "At the very same time that we've seen these areas in the middle latitudes with sub-zero temperatures and big snow storms, the Arctic has been much, much warmer than normal." Ten to fifteen degrees warmer in some places. According to Serreze, the shift in the Arctic Oscillation has nothing to do with climate change and everything to do with the vagaries of weather. At the same time, he says, the chances of going so negative are exceedingly small. Map of temperature anomalies for December 2009 at roughly 1000 metres altitude for the region north of 30°N (NSIDC). Areas in orange and red correspond to strong warm anomalies. Areas in blue and purple correspond to cool anomalies. Eurasia and North America are experiencing unusually cold conditions. On the other hand, Greenland, eastern Siberia and the Arctic ocean are experiencing unusual warmth. The warmest regions (more than 7° Celsius above average) are over the Atlantic side of the Arctic, including Baffin Bay and Davis Strait. Unsurprisingly, sea ice extent was below average in this region. These strong contrasts in temperature are the result of a strongly negative phase of the Arctic Oscillation. This is caused by opposing patterns of atmospheric pressure between the polar regions and mid-latitudes. During a negative phase, pressures are higher than normal over the Arctic and lower than normal in mid-latitudes. In December 2009, the Arctic Oscillation index was - 3.41, the most negative value since at least 1950. Note the blue dot in the bottom right corner representing December 2009. October 22nd. A weather station in Berchtesgaden National Park in Bavaria has recorded the coldest temperature ever in Germany during the month of October. The thermometer dipped to -24.3C or -11.7F. New Hampshire: Mt. Washington hasn’t been above freezing in nine days. They had over a foot of snowfall in the first two weeks of October and temperatures for the month are more than 7 degrees cooler than average. They had over a foot of snowfall in the first two weeks of October and temperatures for the month are more than 7 degrees cooler than average. Monday, Oct. 19, 2009 Temperatures' are rebounding after what was record-breaking cold morning in Charlotte. This morning’s unofficial low at Charlotte/Douglas International Airport was 30 degrees. That is the coldest since March 5, when the low was 29. This morning’s reading broke the old record for the date, 31 degrees, set in 1948. After computing all the average temperatures from every day this winter, the National Weather Service said the average has been a little less than 56 degrees in Orlando. That’s over a degree colder than the city’s previously coldest winter on record, set in 1954. This morning's low temperature broke three records for this date. It was 59 degrees at Honolulu Airport at 6 a.m. breaking the 19-year record of 61 degrees. Yesterday's low at the airport also set a record. Kahului Airport on Maui was downright chilly this morning where a 54-degree reading was recorded. The previous record was 57 degrees. This morning's record low also was the lowest temperature ever recorded in April at Kahului. Hilo Airport on the Big Island was 61 degrees, breaking by 1 degrees the low reading recorded in 1959, 1965, 1973 and 1981. The volcano began erupting on April 14, releasing ash that last month caused the biggest aerial shutdown in Europe since World War II, affecting more than 100,000 flights and eight million passengers over a week. Parts of the UK have already seen frost this weekend and temperatures plummeted to a freezing -3.6C in Shap, Cumbria, yesterday night. Temperatures will now remain far below the 18C average for this time of year. 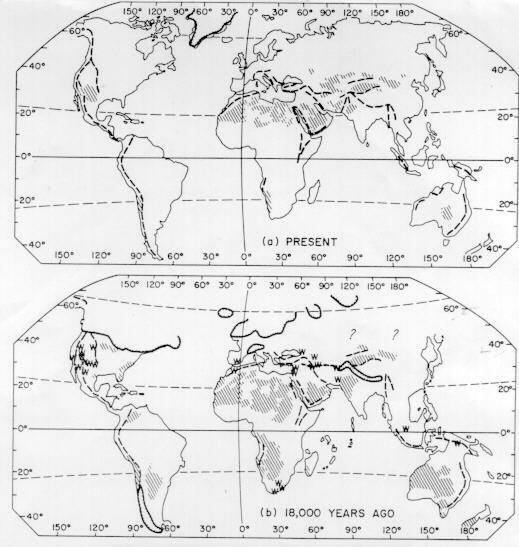 As the Indonesian impact was at low latitudes, the low to moderate latitudes were affected, noticeably Florida and Hawaii. Figure 12. The Washington Storm Is A December Record! 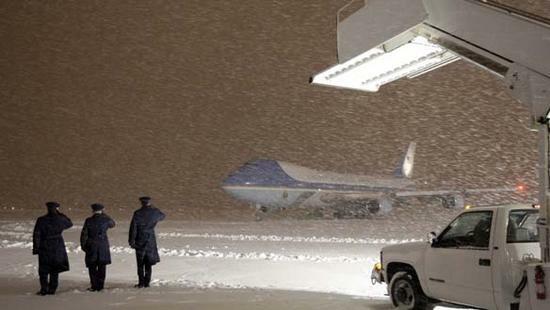 And Obama Arrives At Andrews Air Force Base The impact injected dust into the low to mid latitudes. Not only was there cold weather, but precipitation caused copious snowfall at the lower mid latitudes where such amounts of snowfall has seldom been observed. An update: Here’s more of the same from New Zealand, Montana ,Wyoming, Oklahoma, South Dakota, Nebraska, and Kansas. Chilly weather kept temperatures down to record low levels across Otago last month, with Dunedin experiencing its coldest October since records began about 60 years ago. Nationally, it was the coldest October in 64 years, with an average temperature of 10.6degC (1.4degC) below the long-term average) and record low temperatures recorded in many areas, including Otago, the National Institute of Water and Atmospheric Research (Niwa) climate summary says. South Australia has recorded its hottest November on record, with some regions setting rainfall records as well. Record snowfall totals were reported Saturday afternoon at Washington Dulles and Reagan National airports -- and snow was still falling. Accumulation at Dulles reached 16 inches, breaking the old record of 10.6 inches set December, 12, 1964; 13.3 inches was reported at Reagan. The old record there was 11.5 inches set December 17, 1932. The Mid-Atlantic region sees its second huge storm in less than a week. The all-time 24-hour snowfall record for Dallas-Fort Worth was broken as of 4 A.M today, with 12.5 inches of snow. The National Weather Service says the previous record was 12.1 inches set in 1962. The snow began to taper off today as a winter storm warning remained in effect for parts of north Texas. Snowfall reports ranged from 6-14 inches. And as much as 3 inches could hit Savannah, Ga., where snow was last traced in February 1996 — “and that was only 0.2 inches,” Lamb said. It’s been two decades since Georgia’s oldest city had any notable accumulation, with 3.6 inches falling in December 1989. Normally, temperatures in February don’t dip below 41 degrees. “There’s no doubt this is a significant event for us,” Lamb said. Figure 13. The 2010 Winter Olympics In Vancouver, British Columbia To Helicopter In Snow To Cover Mountains. The global cooling at low and mid latitudes seems to have deprived the higher latitudes of precipitation. Notably, Toronto and Vancouver have experienced significant declines in the anticipated snow levels. The California cities of Monterey and Sacramento experienced some record rainfalls, but that's' about it. Toronto finished November 2009 without as much as a trace of snow. That's the first time in 70 years of official records that there has not been any snow in November. Unofficial records indicate that this may have broken a 162-year record. STORM LEAVING SACRAMENTO REGION AFTER NEAR-RECORD RAINFALL - April 12th, 2010 The rainfall total for this month in Sacramento stands at 1.48 inches. That surpasses the normal for April, which is 1.17.